Former first lady of the United States Barbara Bush, one of only two women in history to be both the spouse and the mother of an American president, died on Tuesday. She was 92. A statement released by the George H.W. 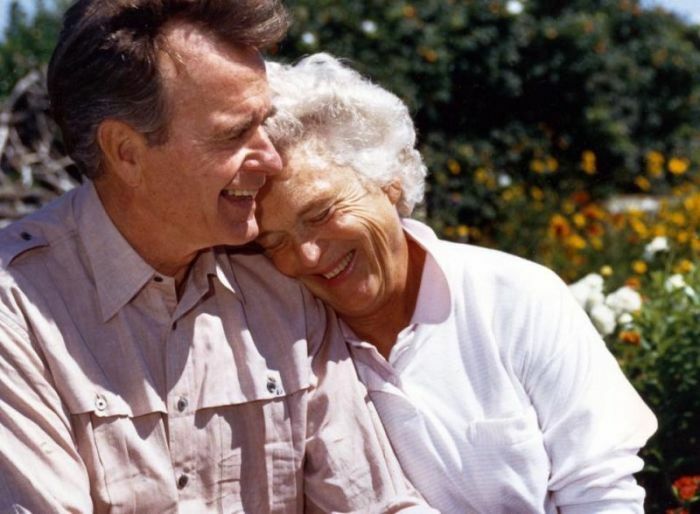 Bush Presidential Library Foundation Tuesday evening said that the former first lady passed away, leaving behind her husband of 73 years, former President George H.W. Bush, five children and their spouses, as well as 17 grandchildren. Born Barbara Pierce in New York City in 1925, she met future husband George H.W. Bush when both were teenagers. The two wed in January 1945 and had six children. One of their daughters, Pauline Robinson Bush, died of leukemia in 1953, a couple of months before her fourth birthday. Mrs. Bush's hair began to gray during this time in response to the stress of her child's fatal illness. "I saw that little body, I saw her spirit go," recalled Mrs. Bush in a 2012 interview with her granddaughter, Jenna Bush Hager, that aired on the "Today" show. In 1988, Mrs. Bush became the first spouse of a presidential candidate to address the national convention that nominated her husband. Mrs. Bush was an advocate for literacy, founding the Barbara Bush Foundation for Family Literacy in 1989, the same year she became first lady. "Mrs. Bush stated that if more people could read or write, 'we could be much closer to solving so many other problems that our country faces,'" noted the organization's website. "She recognized that providing access to literacy programs was essential to helping parents and children have an equal chance to succeed in life. Her work has helped to improve the lives of many families across the nation and continues to inspire the next generation of learners." During her husband's term in office, Mrs. Bush wasn't known to be involved in White House political decisions, once remarking, "I don't fool around with his office and he doesn't fool around with my household." While serving as first lady, she wrote a book published in 1990 titled, Millie's Book: As Dictated to Barbara Bush, which talked about life at the White House from the perspective of the family dog Millie. A member of St. Martin's Episcopal Church of Houston, Texas, for many years, Mrs. Bush was also good friends with the late Ruth Bell Graham, wife of the Rev. Billy Graham. The two frequently corresponded, with Mrs. Graham once reportedly telling Mrs. Bush as a joke that while she had never considered divorce, she had considered murder. The two families have known each other for many decades, with the Bushes hosting the Grahams on multiple occasions at their home in Kennebunkport, Maine. "I remember the first time I saw [Billy Graham]. ... I was shocked by the eyes. They were ... they're so penetrating," she recalled, according to ABC News. In 2001, Mrs. Bush became the first woman since Abigail Adams to have been married to a president and be the mother of a president when her son, George W. Bush, was sworn in for his first term. In 2015, the Bushes celebrated their 70<sup>th wedding anniversary. When asked about how their marriage had lasted so long, Mrs. Bush once remarked, "I think we grew together." "I think that when you have a child die and you survive, and you've been through a war and you survive, and you build a business and you survive, you either grow apart or together. We always turned to each other," Mrs. Bush explained. In recent years, she had experienced increasing health problems. On New Year's Eve 2013, Mrs. Bush was hospitalized for a respiratory issue that turned out to be pneumonia. She was released days later. "I cannot thank the doctors and nurses at Houston Methodist enough for making sure I got the best treatment and got back to George and our dogs as quickly as possible," she said, according to CNN. On April 15, the Office of George H.W. Bush released a statement explaining that following a series of hospitalizations, Mrs. Bush had decided to cease seeking medical treatment. "It will not surprise those who know her that Barbara Bush has been a rock in the face of her failing health, worrying not for herself — thanks to her abiding faith — but for others," stated the office. A public viewing for Mrs. Bush will be held Friday between noon and midnight at St. Martin's Episcopal Church. A private funeral will be held on Saturday. 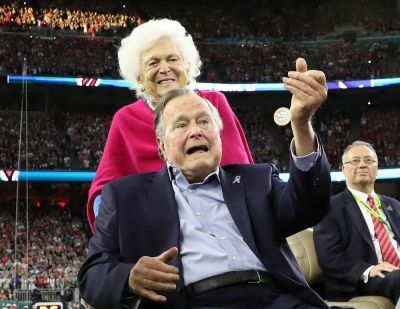 Mrs. Bush will be buried Saturday at the George H.W. Bush Presidential Library Center in College Station.